If you have just moved into your new home, bought a new tv, or your old TV stand has broken down, we have the best TV stands for you. If you want a quality stand that will last for many movies and television shows, we are eager to share these stands with you. Now, it is important to keep in mind that there are a wide variety of different stands on this list ranging from large for large flat screens, to small entertainment stands for smaller televisions. With that, it was our primary intention to share the ten best quality stands that someone can buy so they can enjoy their TV in comfort. If you live in an apartment, a home, or a small studio, there is a stand on this list for everyone. Without further wait, let’s explore the most notable TV stands someone can buy, and stay tuned for our criteria on how we came up with this list later on in the article. Let’s begin! As the first product on this list, we can consider this a space-saving tv console system for many reasons. It is durable, sturdy, and boasts a traditional design that consumers will appreciate. 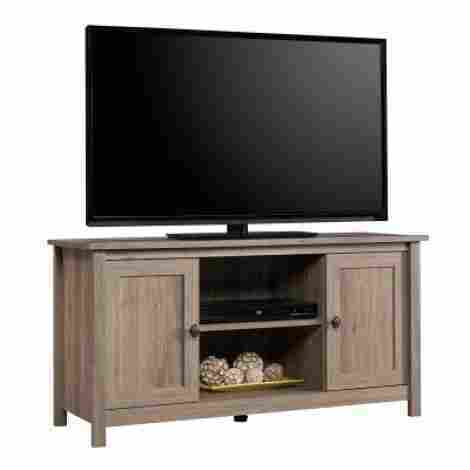 Let’s talk about the WE Furniture 58” Wood Corner TV Stand Console and two different aspects why it is a high-quality product. Have you ever been assembling an item and found it to be confusing and frustrating tasks that you can embark upon? That is exactly how we feel when it comes to most assembly items, but not this one. This particular brand has designed this product with a ready-to-assemble system and step-by-step instructions that make it easy to set up, assemble, and use in no time. So this particular space-saving system is actually a corner TV Stand. However, the brand offers many different designs and colors. If you want this in all black, natural wood, or even brown, they have it. Additionally, the brand also has this particular system in a non-corner shelf design and a recent and new color known as Natural. What we can take from this product is that it is quite inexpensive for the design. 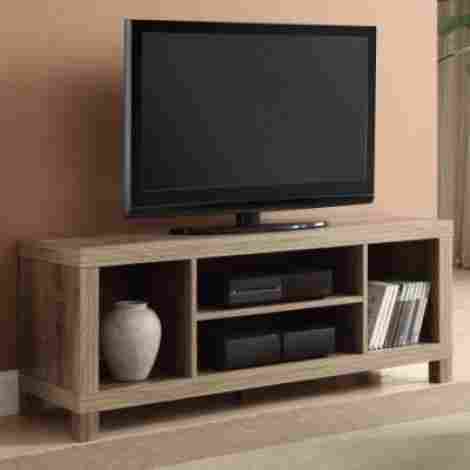 In fact, it is a simple TV stand design that is easy to use, well designed, and includes a textured finish that is quite rich and natural looking. It is important to keep in mind that it is not real wood, it is laminate, which tends to get a bad rep. This laminate is highly durable and well worth it if you are considering it. Durable and does not chip. May warp if wet or condensation drinks are placed on it. Laminate may lift or wear and tear after years of use. Let’s talk about the simplest TV stands in the industry. 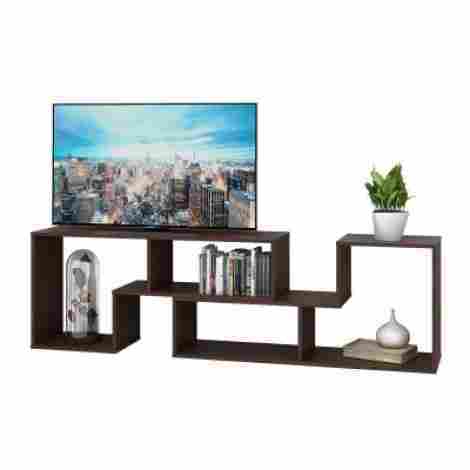 With a three-tier system, this TV stand is ideal for dorm rooms or small apartments where consumers are looking for a simplistic and easy design. The Convenience Concepts Designs 2 Go TV Stand is well designed, easy to set up, and representative of its name, convenient! Here are two unique features of this product. Part of what makes this product as simple as it is is that it has a contemporary design. With that said, the design comes in a variety of color choices ranging from black to white, brown, and even cherry colored. With that, the top of the system is designed to hold a 42-inch plasma screen tv. So, part of the design of this product is that it has a tool-free assembly, making it easy for people to easily set it up in no time. Alongside this, the system is designed to have space for other items such as a DVD player or video game system. However, it is important to note that it has a 100-pound weight capacity. As we discuss the price tag and the value of the item, this particular system is not high end and it is the cheapest stand you can get. With that, if you just move into an apartment or want a space-saving system that is small and can hold some of your electronics, this is it. Overall, it is not a luxury tv stand by any means and can only hold a tv up to 42 inches. Contemporary design with many color choices available. Easy installment system that is tool free. Now that we have talked about a space saving tv stand, let’s talk about a tv stand designed for the contemporary living or media room. If you want a large tv stand that can hold up to 80’ of TV space, this is the media stand for you. 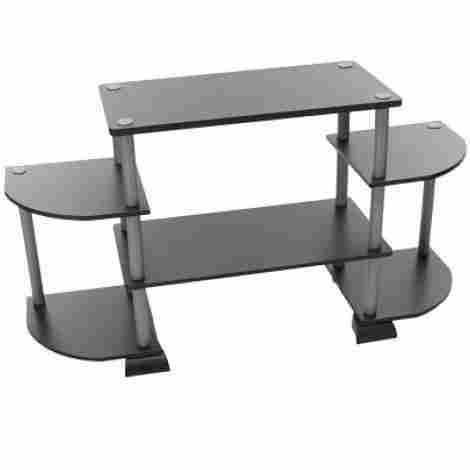 With different color choices available, we want to share the Prepac BCTG-0001-1 Sonoma 72 Inch TV Stand, a quality stand designed for durability and style. Part of what makes this product great quality is that it is made from composite wood that is backed by MDF backer, meaning it is extremely durable. With that said, the construction process is made completely from non-toxic materials and includes a durable black laminate design to ensure that the overall system lasts a long time. As far as beneficial aspects, this particular product offers a cutout design and the overall decorative side moldings. First, the cutout design makes it easy for people to manage their cables as well as allow for better ventilation of electronics. Alongside this, the side moldings add an aesthetic appeal that defines the overall design and architecture of the product. As we discuss cost and value, part of what makes this product a bit more expensive than most is the overall size. However, consumers have the option to choose from stands as low as 32” and as high and large as the 72” stand. This brand offers a wide selection of different styles, colors, and assembly options ranging from corner to panel tv stands. Quality design that is well constructed. Side molding design is well refined. Certain areas may chip during the assembly process if not careful. Although this next entertainment center is not designed for luxury, it is designed for convenience. 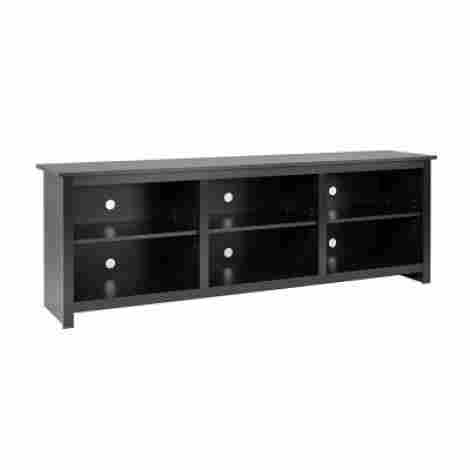 The Furinno Turn-N-Tube Corner Tv Center is great for customers that have minimal space and want plenty of shelving. With six different shelves allowing for multi-use and space, this is well designed and perfect for small apartments or other. Have you ever wanted an item that essentially came assembled all by itself? Guess what! This is one of those products. This product is designed to take a maximum of 10 minutes to assemble and requires no tools. With that, it is better on sturdy surfaces rather than carpet and it is designed to withstand about 50lbs. Although this particular product is not high end or designed for high-end appeal, it is compliant with industry-standard. It has received the Forest Stewardship Council certification due to the CARB composite wood design and material quality. Alongside this, this product is designed with a ‘Green Label’ name, making it a product that focuses on environmental safety when in the construction process. Considering that it is designed to be ‘Green Friendly’, this item is actually inexpensive and for many different reasons. First, it is not large by any means and it can easily chip or wear and tear. However, if you are careful, you will have a quality product that can last for many years. Just don’t put too much weight on it. Cannot hold a lot of weight. This next television stand models the traditional designs with a hint of modern elements. First, it is designed with a barn wood finish to offer a quality style and appearance that makes it well worth your consideration. 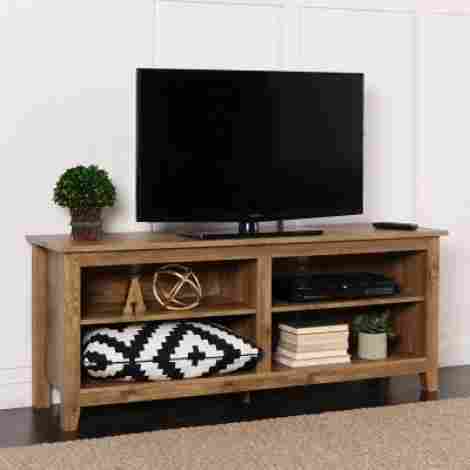 Let’s share two points about the high-quality, solid, and sturdy Home Accent Furnishings New 58-Inch Wide Barnwood TV Stand. You know an item is well designed when you can knock on it and it feels like real quality materials. This product is so sturdy and so well designed that it can support 250 lbs. With that, it can accommodate up to a 60-inch television and offer endless amounts of quality space for books, DVD player, and much more. Now, this is a barn wood finish item. However, the overall material is a high-grade MDF that includes quality laminate exterior and texture. With that, it is not made of real wood but it feels sturdy and well worth the consideration. Alongside this, the finish is high quality and it is all around the product, including the interior, which comes with adjustable shelves. What do you think of this overall product? If you want a high-quality TV stand that looks wealthy and rich, this is the TV stand to get. Not only is it well designed and very sturdy, it's considered a leader in its class for the price. Alongside this, it is easy to assemble and has adjustable shelves. Overall, we highly recommend this product. Not as high quality as other tv stands. Previous customers have mentioned that the shelves may chip due to low quality. Now that we have come to the middle of our list, we want to share a quality TV stand that is well designed and even has two doors for a more traditional and simplistic look. 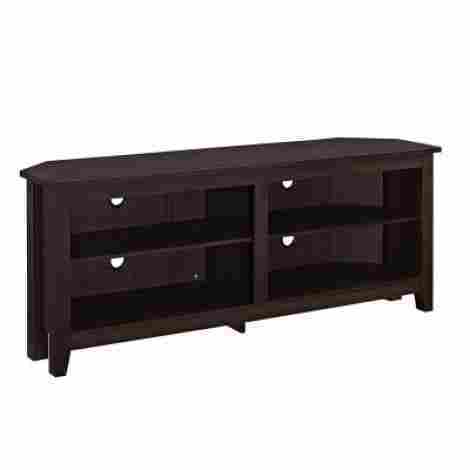 This is the Sauder 4177772 County Line Panel TV Stand and here are two features of this product. Part of what makes this product a bit more traditional is the natural wood design and aesthetic look of it all. In this, it is also designed to be rather urban with framed doors and period hardware. Overall, it is a piece that matches in any contemporary home and goes well with natural and organic shades and neutral tones. Part of what makes this product well designed is that it comes with the ability to hold a 47” TV and provides plenty of space for audio and video equipment. With that, it also has space for it to hold DVD and CD on the center shelf and it even has an adjustable shelf behind each door for added room and space. Let's take a minute and talk about cost. This is well designed and boasts an incredibly simple design that is easy to assembly. With that said, it can hold up to 70lbs and each shelf is fully adjustable. Overall, we can agree that it is a well-designed product that is durable and look well in any home. Framed door design is quality. Period hardware with urban look. Can hold up to 47” TV. Previous customers have mentioned that the assembly takes a long time. Instructions are hard to understand. 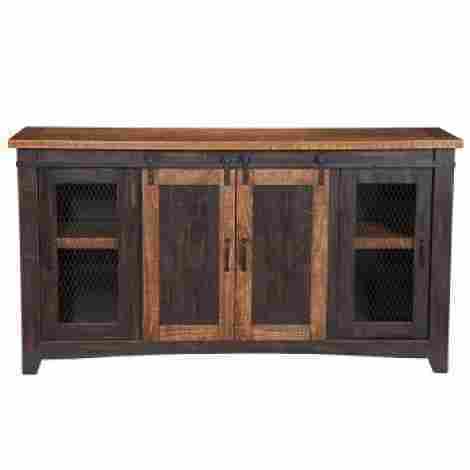 This next TV stand happens a simple and classic design alongside a rustic oak finish that is well made and durable. With that, it comes in a variety of different color options and is easily adjustable. Here are two special features of the Cross Mill Tv Stand Rustic Oak and what consumers can expect from this specialty product today. Now, to be honest, particle board is not known as the most sturdy or durable. However, it is MDF and particle board blend and previous consumers have touted how durable the product is. With that, it is easy to assemble and comes with every hardware piece include so people can easily assemble it and enjoy the benefits. This particular product has a versatile design with many different compartments and storage options. Consumers can place everything from a DVD player to books and still enjoy the many benefits of this well-designed product. Moreover, it is well constructed and offers a great look and design to any home wanting a simple piece of craftsmanship. When it comes to looking at the price point, this item is well designed and well constructed. With that, the assembly process is easy and it even comes with handy instructions. Overall, we believe that it comes with its positives and negatives. Well designed and simple construction. Different size and colors available. Particle board is very cheap product. Now that we have introduced a wide variety of different styles, we want to go a bit more modern with this particular product. This product is known as the Monarch Specialties I 2574 Dark taupe Stand with drawer. It is well designed and has an art-deco style that makes it ideal for the modern home. Here are two unique features of this particular product that we highly recommend. Although it is not real wood, this product actually is created with a thick panel construction that is highly sturdy and durable. Since the overall design is an art-deco style, the construction needs to ensure maximum weight capacity for the areas where it looks like there is no support. So, it's safe to say that it is highly durable and well designed. So, the design is quite modern, but is it beneficial or practical? Actually yes! There is the top space for a TV and middle space for DVD player and décor. Now, the bottom space is the largest and it can boast a sound system and it even comes with a drawer for easy storage options. Overall, we think the design is not only modern, but it is practical and well constructed. This product is well designed and boasts a variety of features making it a great addition to any modern home. With that, it is a bit more pricey than most, but you are paying for quality construction and a well-designed style. With close to five star reviews, we can see why this is a fan favorite product. Melamime material is low quality. This particular item happens to be the highest quality on this list and for many reasons. 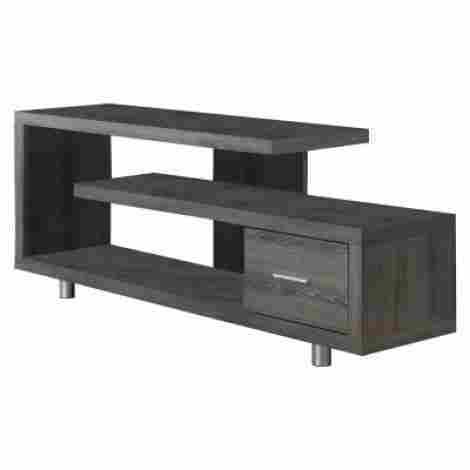 If you want a quality TV stand and the price is not an option, we highly recommend the Martin Svensson Home Sante Fe 65” TV Stand, a quality designed TV stand made from real materials. Here are two unique features of this product. What is the difference between real materials and fake materials? You tend to feel the difference! In this, this product is made from solid pine and well designed black metal construction to resemble a rustic and modern appeal. With that, this stand is made with an antique black and distressed pine finish to give it a worldly look and appealing style. Part of what makes this product even better is the overall construction. This item actually has adjustable and removable shelves that allow for better storage quality which makes it easy to store décor or electronics. Alongside this, there are a wide variety of colors to choose from, all with their own unique benefits. As we discuss cost and value for this item, we highly suggest it for the material composition and overall design. It is high quality, well designed, and of course, you get what you pay for, so it is real. With that, it has close to five stars and no complains when it comes to durability. Well designed and no tools required. This product has a strong odor, wood and metal. As the last product on this list, this is a fan favorite for many of our writers and consumers. The reason being is that this product can double as a TV stand and a bookshelf. In fact, it actually has a particular design element that makes it easily adjustable and able to be shaped into different forms and styles. 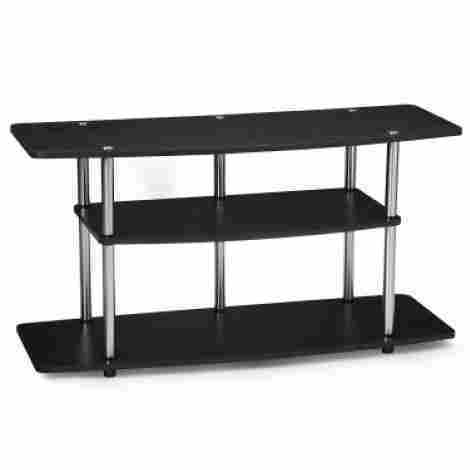 This is the Devaise 3-in-1 Versatile Tv Stand Bookcase and here are two features of this particular item. Although this item is thin and it seems to be quiet fragile, it actually has an overall weight capacity of 75lbs. Furthermore, it is easy to assemble and well designed and constructed. Part of the design is meant to be used as a bookshelf, so naturally, it is made to withstand the wear and tear of heavy items. This item is made from MDF board and melamine, which happens to not have the best track record. However, consumers have mentioned that the quality of this product is not a worry. In fact, this item is actually scratch resistant due to a special coating and well-designed finish. With that, you can choose between black, brown, white, and other colors. Considering the fact that you are receiving endless value when it comes to this item, it is well-priced and designed with a sturdy and quality design. Alongside this, the overall design of this product ensures long-term wear and tear as well as storage benefits. In fact, when used as a TV stand, it is rather larger and offers enough space for books, electronics and more. Versatile system that is easy to use. Eco-friendly board that is scratch resistant. Paint may chip if not careful. Not as sturdy as other stands. Now that we have talked about the best TV stands. Which one is your favorite? As far as furniture, you really have to be selective and compare your options because the wrongly built furniture can lead to a lot of nightmares and hours of frustration. With that, there is a slew of factors that need to be properly aligned and in a dance with each other to ensure that the overall design of the product is well designed and crafted. In this, we took it upon ourselves to ensure that all of these factors were met for our audience. So, if you want to get to know the guidelines that we have set in place to ensure that these TV stands were well designed and worth your attention, check out the criteria portion of the article below! As far as furniture, without a doubt real materials will tend to cost more money, such as real wood, metal, or other different materials that are designed for durability. With that, there is a large selection of furniture that is designed with materials that are known as ‘composite’ materials. This is what most of the pieces of furniture we have shared above are made from. Therefore, we had to ensure that the construction value was up to par and designed to withstand wear and tear. So, here are a couple of different important things to consider when purchasing a tv stand whether made of composite wood or particle board. Composite Wood / Particle Board – It is detrimental to ensure that you are careful with the corners or the edges when putting a piece of furniture together because it can chip easily. With that, this material can also warp easily if you place a hot cup or cold item on top because condensation can seep through and cause the material to lift from underneath in certain areas. However, it is durable and lightweight and ensures that consumers can put it together easily. Which brings us to the next criteria. Following the construction value, we found that the set-up process is as equally important to the overall construction of the item. Why? Well, we wanted to make sure that setting the item up was not only easy to understand but that all of the pieces were properly designed and aligned. With that, we wanted to make sure that all of the pieces of the overall product were well constructed, and everything was included. Lastly, we wanted to make sure that everything was measured correctly as far as the alignment of the screws and placement of the overall holes and tools of the item. Which leads us to other criteria that helped us identify the overall value of the product. As a key criterion that we looked into, we found that the reviews were a detrimental factor in selecting the best TV stands. The reason being is that the reviews guided our research when selecting each product for today’s list. The reviews were a turning point in making sure that all of the TV stands where well designed and durable. With that, we discovered that most consumers find these TV stands to be both useful and convenience when looking at their quality and appearance. When it comes to the evaluation process, we wanted to ensure that the brand was a reputable brand. Primarily because there is a wide selection of different furniture brands and we wanted to weed out the best brands you can get your TV stand from. With that, we can say that when it comes to the brands on this list, they’ve all had years in the furniture industry and have excelled at creating quality pieces that are intended for durability and longevity. Different factors that we took into consideration when it comes to the brands are their customer service and overall return policy. We wanted to ensure that in the case any individual may have a problem with a stand, they are able to return it in no time through a swift and easy process. Lastly, we wanted to measure the brand’s warranty when it comes to their products. As the last primary criteria that we looked, we found the overall design of the product to be an important factor to consider. The reason being is that we wanted to make sure that there were a wide variety of different designs and available selections for our audience. What we found in the process is that many brands actually make different color copies of the same furniture design style, so people not only get a wide variety of designs with this list, but also a wide variety of available color choices. Now that we have shared the best TV stands and the criteria when selecting them, we want to answer a couple of the most common questions that people are having. Q: How long does it take to put together? A: This is a main question that people are asking, this question is determined by the style of the product and whether or not it requires tools. So, there are two different types of TV stands on this list, tool-free stands that require no added tools, and TV stands that do require tools. Furthermore, tool-free stands take between ten to twenty minutes to set up, while stands with tools require about double the time to set them up. Moreover, all come with instructions to make the process as seamless as possible. A: Furniture normally does come with a warranty, but it normally is a thirty to ninety-day return policy in the case you want to return it. However, the warranty normally tends to be a limited warranty. Therefore, if the warranty is your concern, we highly recommend looking into the warranty of each manufacturer and what it entails as far as damage and returning the item. Q: Is the furniture scratch resistant? A: Most furniture that is made from particle board or wood composite tend to have a wood-grain film over it. However, most are not scratch resistant. With that, there is only about two scratches resistant Tv stands on this list. With that, if scratch resistance is important, it is important to look at wood composite as a lesser quality material. Q: Are there precut back holes? A: As for question number two that people are asking, if the furniture does have a backing, then it is most likely precut to have cable extensions and management available. With that said, most pieces of furniture do have precut holes to ensure someone can easily connect their electronics and other items. However, there are a couple pieces of furniture on this list that do not have backing at all so precut holes would not be necessary. Q: What tools are necessary to set the item up? A: As a common question that consumers are asking regarding furniture has to do with setting up an item that is not toll-free. The most common tools necessary are a screwdriver and at times, a hammer. The hammer would be needed if the instructions called for nailing down a piece of backing to the back of the furniture. With that, a screwdriver is the most common.